Hi all! First off, my apologies for the recent hiatus. In August I started a new job – working for an awesome nonprofit organization in San Francisco. Although it’s been going great, it also has been a huge adjustment schedule-wise, which alas has not allowed a lot of time for much else. (My sched is somewhat all over the place in that it involves working weekends and such). So as much I have wanted to blog—especially since the Bay Area is such an inspiring place for herbivores—it hasn’t really worked out that way. Fortunately, things are starting to calm down a bit, so hopefully posts will not be so few and far between from here on out. But enough about me. 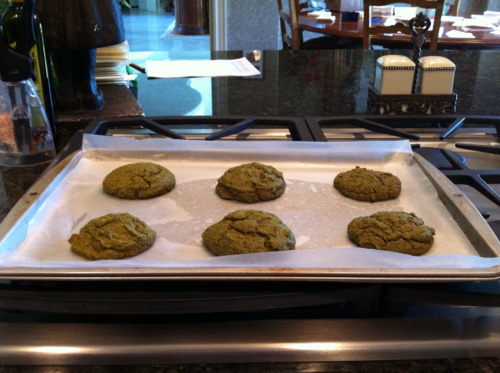 The following recipe is adapted from blog site Choosing Raw. The recipe requires a few steps, but is well worth it in the end. Not to mention makes for an excellent packed lunch…you hear that, working gals?! 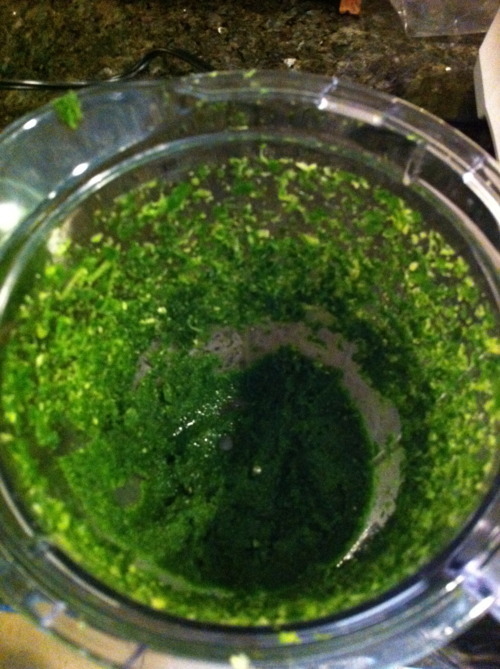 The first step is to make the green juice pulp. If you’re lucky enough to own a juicer, this part is easy — just save the pulp leftover from a green juice drink. However, for those who have yet to invest in a juicer but want one really really badly (aka moi), you will have to settle for using a blender to whip up the green pulp. Blend spinach, kale, parsley, and whatever greens you happen to have in your fridge and blend until you have a gloriously green, pulpy mixture. Make sure to use enough greens to make two cups worth. Next up, you want to process your sunflower seeds. Then add the remaining ingredients and process until well mixed. 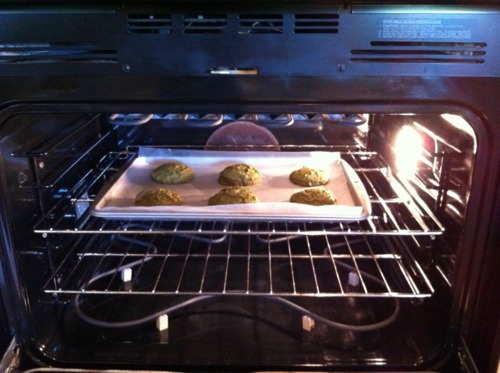 Finally, shape the green mixture into a “burger” like shape, and place onto a lined pan to bake. Bake for about 35 minutes at 350 degrees. (Or for those true raw foodies who have a dehydrator — dehydrate at 115 degrees for 8 hours, flipping midway). No dehydrator yet, as you can see. 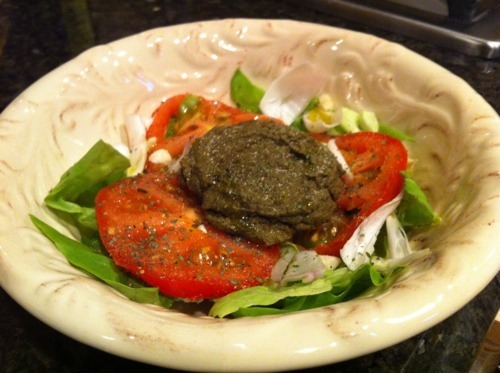 Lastly, enjoy your green burger over a fresh salad with tomatoes, onions, basil, and any other accoutrements of your liking. I have to say that I’m a huge fan of this recipe. So tasty…and satisfying! Made something similar to this on the weekend, though not with raw ingredients, using chickpeas, edamame, and brown rice flour as well as a little seasoning. Now, I don’t have raw greens pulp, I am one of the lucky ones with a juicer and have a lot of beet, carrot and ginger pulp. Might just have to experiment with it to make beet burgers tonight.